Popcorn is a movie night classic, but oh, the fat! 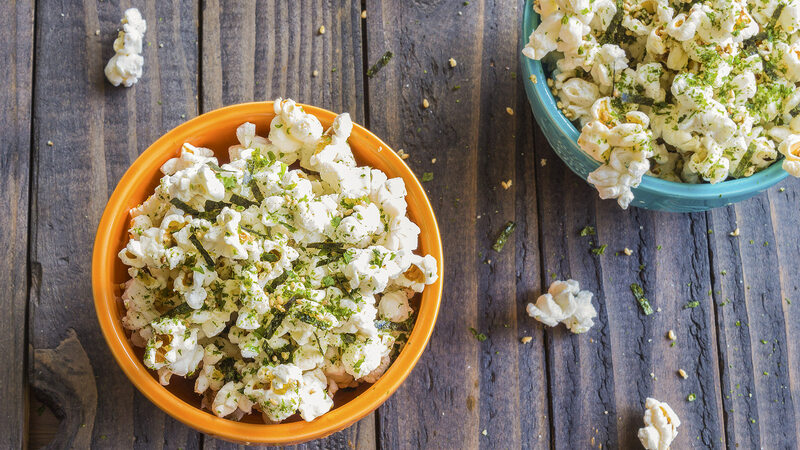 It’s one thing to splurge at the theater, but at home, it can be healthier (and tastier) to opt for natural popcorn seasoned with herbs, spices and other sprinkle-ables. In fact, you can even have sweet popcorn treats with fewer calories than most movie popcorn. As you might guess, you have to start with natural popcorn. You can, of course, use natural microwave popcorn and spritz it with a little cooking spray or low-fat butter spray before adding the toppings, but the stovetop method is actually a lot more efficient because it ensures the oil (which you need to hold the toppings on) and toppings are disbursed evenly throughout your popcorn. And despite what easy-popcorn manufacturers would have you believe, DIY popcorn seasoning is ridiculously easy to make. If the toppings you use don’t stick as well as you want with this recipe, don’t add more oil, or it won’t combine properly. Stick with spritzing a little cooking oil or no-calorie butter spray. Pour the popcorn into a large grocery bag or giant (plastic) bowl with a lid. There should be plenty of “air” in the bag for the popcorn to get tossed around. Add your seasonings, roll it up (or put the lid on), and shake like mad until it’s combined. If a recipe calls for kosher or sea salt, grinding it into a fine powder works best. Just make sure you measure it before you grind. Otherwise, use half the amount of fine or popcorn salt until you’re sure you need more. With stickier or non-dry toppings, it’s sometimes helpful to mix them in a little at a time to make sure you get the best coating.